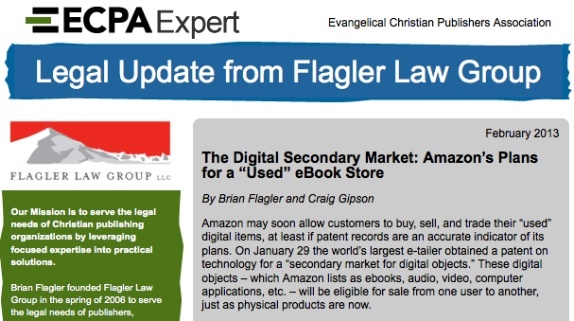 Industry legal experts Brian Flagler and Craig Gipson, with The Flagler Law Group, provide ongoing and timely Legal Updates to ECPA members at no charge. Updates apprise ECPA members of timely legal events and issues affecting the industry. Legal Updates are available only to employees of ECPA member companies. If you are employed by an ECPA member company and would like to receive the latest legal analysis of forthcoming legal issues that affect Christian publishing, you can subscribe through your ECPA.org community profile.